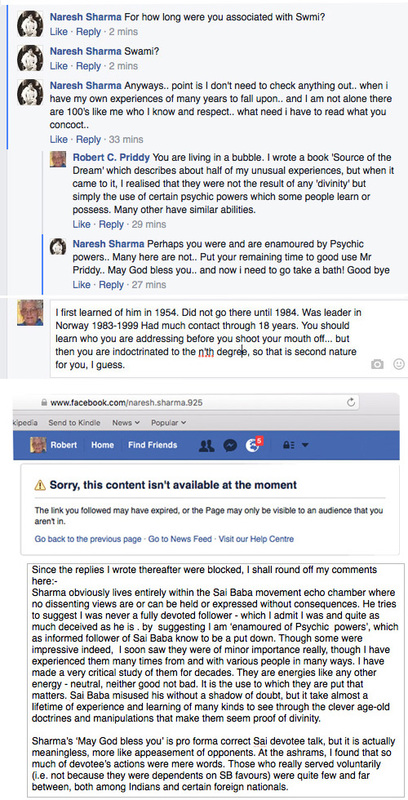 A young and fully indoctrinated follower of Sathya Sai Baba, Naresh Sharma, is making as big a splash as he can on the internet, ignoring every fact about Sai Baba’s deceptions, failures, crimes and abuses of faith, including sexual abuses. This is seen in his zealous comments on Facebook when I added a comment there. 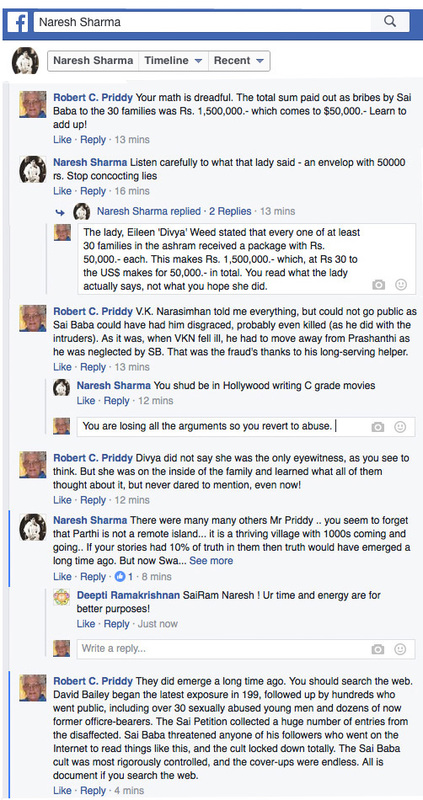 He recently tried to comment on Eileen Weed’s already much visited remarkable YouTube posting Murders in Sai Baba’s Mandir Puttaparthi 1993 – YouTube about the covered-up murders and there accused me of lies and laughable errors about the sums in bribes paid by Sai Baba. He also claimed the boys who slept in Sai Baba’s rooms were pure and indirectly implies that they were not sexually involved. However, the entire furore about these abuses came to light within the Sai movement (and the world press) when a number of students asked for help from their concert pianist music teacher to get Sai Baba to stop these abuses. That eventually brought forth a flood of testimonies and affidavits from others who fell foul of Sai Baba’s sexual and many other abuses.The Sai Baba scandals which broke from 199 have been taken up by many top international news outlets (see documentation) and by UNICEF, the US State Department, UK Parliament and it took the combined force of the devotee Prime and Home Ministers to suppress the CBI investigation when it was close to delivering its guilty verdict. This entry was posted on February 20, 2017 at 11:06 am	and is filed under Sathya Sai Baba. Tagged: Naresh Sharma. You can follow any responses to this entry through the RSS 2.0 feed. You can leave a response, or trackback from your own site.